Coconut Milk Pulao is an easy rice dish that is mild but flavorful which goes very well with any spicy masala non-veg fry items like Boiled Egg Masala, Chicken Fry, Shrimp Fry, Shrimp Tomato Masala ... and so on. ( you got the point , right!). I can simply call this dish a Coconut Rice, but it is not that. As I don't want you to get confused with Coconut Rice which is another Rice & Coconut combination that is made differently with cooked rice and grated coconut. On the contrast in this recipe, Basmati Rice is roasted along with spices until it gets fragrance and then bathed in coconut milk in turn it gets the Shiny Texture and Tasty Flavor which is not that spicy, in fact it will get very mild sweet taste because of the Coconut Milk, that's why it goes very well with Spicy Non-veg dishes to compliment. Usually I don't prefer any vegetables in this recipe as it kills or transforms the Coconut Milk taste, the only vegetable I prefer is Green Peas, which adds some color and enhances the coconut flavor. ( Of course you have to use lot of Onions, I don't consider Onion as separate veggie as I can't cook anything with out Onions.) 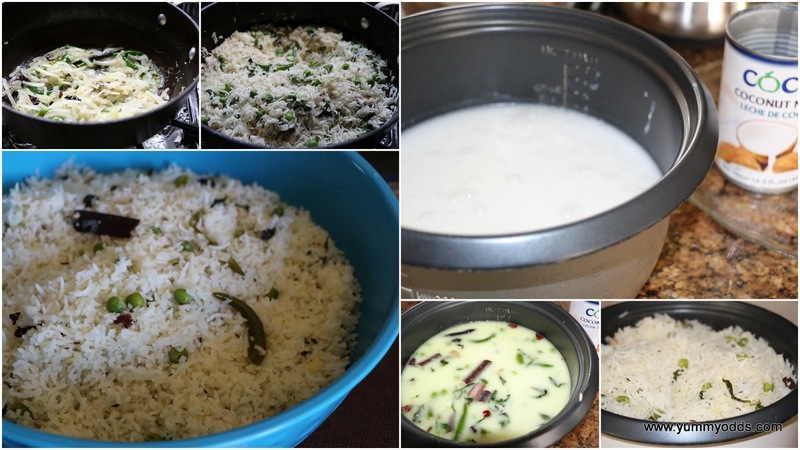 Here is the simple South Indian non- spicy rice dish Coconut Milk Pulao recipe.., Njoy! Wash Basmati Rice and Drain in colander. Chop Onions and Green Chili into thin long slices. Thaw frozen peas in a microwave for 1 min. Heat Oil in the Non-stick pan. Add butter after once the oil is hot. Add the spices to oil in this order Shazeera, Clove, Cardamom pod, Cinnamon and Star Anice. Saute them for 1 min until the nice aroma comes. Add Ginger Garlic Paste. Saute for 2 min until oil separates from it. Add Green Chili followed by Onion Slices. Add 1 ts salt and saute the onions. Add drained Basmati Rice to Pan and saute well until rice is combined with spices. Add Frozen peas to the pan. Add remaining 1 tsp salt and mix well. Take the Rice Cooker Pan and add 1 Can ( or 2.5 cups) coconut milk. Add 2.5 cups of water to the same pan. Transfer the Rice with spices to the Rice Cooker Pan. Cook until the rice is done according to your Rice Cooker instructions ( usually it takes 15 to 20min). Once the Rice Cooker comes to Warm state, switch off the Rice Cooker and transfer it to Wide Bowl and spread evenly and fluff up the rice. Serve warm with any Spicy Masala Curry. Hmmm that sounds Yummmm! Wanna Grab this Bowl of Yumminess.....! until then simmer with this flavorful rice.. I have always loved coconut flavored rice..This looks so so tempting. It was one of those dishes we had on a vegetarian Sunday..aka ghee rice, loved it with pakoda korma..Yummy rice. Very delicious and comforting pulao. Love this pulao very much with butter chicken.. This sounds lovely! I have never ever seen rice cooked this way. Sure going to give a try...very soon. Thanks for sharing.